It's been a wild morning. Scoop and Au have been chasing each other up and down the stairs, and round and round Au's cardboard box. As it was before 8AM, the earliest hour I'm willing to get up voluntarily, I pretended to be fast asleep. They took no notice of this, and happily wrestled all over the bed when it suited their game. Now that I'm up and ready to start work, our two fuzzies are sitting on the roof of the Beetle, using the height advantage this gives them to keep an eye on our neighbour 2 doors down who is tending his flowers, and Sam next door who's doing interesting things to his car. PS this is an old pic of Scoop having a quiet dinner with Au. Au was about 3 months old when this was taken. 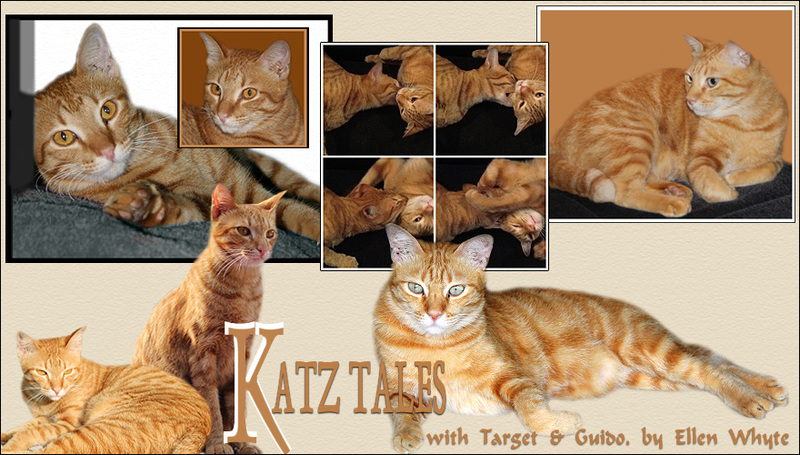 PPS Katz Tales is out in the Weekend section of The Star tomorrow. Feedback appreciated. Scoop is hopping mad. I forgot to check on his chicken liver supplies yesterday morning, so when he turned up for dinner around 8PM there was only a tiny bit left. I tried to cover my mistake by chopping up the half a chicken liver that was left, and surrounding it with one of those expensive foil packs of gourmet pilchards for cats. But there's no fooling old fuzzy. Scoop looked at his bowl, and then he looked at me, giving me The Look that says, "You have messed up AGAIN!" He ate his dinner eventually, but he let me know that every bite was a hurt to his heart. He would have forgiven me this morning except that I rolled out of bed and tripped over him. It's no good telling him I still had my eyes closed, or that I never expected him to be lying by the side of the bed when he's usually stretched out in the middle of it. Scoop is Not Talking. But I have hope. I've nipped out to Carrefour and bought not one but two packs of chicken liver. That should put the smile back on old Mr Brown's face! PS the pic: Scoop and Au having a good time shedding hair on Tom's clothes. The Purina Cat Gift Basket prize is awarded to the best three pictures sent in to Katz Tales published the first Saturday of every month in the Malaysian national daily, The Star. It's the first day of Ramadan (a Muslim fasting tradition like Lent and Yom Kippur. Check this Wikipedia fasting article for more if you're interested) and it looks like it's also the start of the rainy season. It's cloudy, and the rain has been falling in a steady drizzle all morning. I'm having a wonderful time. It's fresh and green and the bed was just the right temperature to invite dalliance this morning. But Scoop and Au are not amused. Not only was their morning walk marred by wet paws and tummies, but the rain has washed away all those enticing scents that tell them who was where and when. Currently both cats are sulking. Scoop is curled up in front of the window, and Au is inside his box - with the flaps pulled closed. I haven't the heart to tell them that a) we'll probably be enjoying rain for the next few weeks, and b) there are going to be lots of strangers around celebrating the end of the fasting rituals. Fat issues aside, I'd better stock up with chicken for Scoop and ham for Au. They're going to need some solace. I have been looking at Scoop and Au and have decided it's time to Take Measures. Scoop has a belly that hangs down, giving him a King of the Savannah look when he walks. Au is quite frankly pear shaped. Something needs to be done. Problem is that it's easy to say you'll put the cats on a diet, but in practice restricting food is difficult. First, Scoop and Au have no compunction about lying to us. They'll tell Tom they've had no lunch a mere 5 minutes after I have fed them. They do it expertly and without shame. Second, cats have so many ways to get back at you. I don't want to be woken up at 2, 3, 4 and 5 AM, nor do I want my plants to be destroyed one by one by retaliatory cats. I think the best plan is to replace their regular biscuits with Science Diet biscuits. Then they'll be eating but getting less calories. PS This is Au sitting on the wall. He sits there every evening, keeping an eye on the neighbours. PPS My first Logomania column has appeared in The Star. It's called I'm eccentric, You're Nuts. Feedback greatly appreciated! Apparently a company called Allerca has been breeding hypo-allergenic cats in order to provide pets for that niche market: cat lovers who get the sneezles when they touch their feline companions. Tests confirm their first success: an 18-month-old cat named Joshua who is hypo-allergenic. These cats are supposed to be on the market from early next year at US$4000 (that's about RM14,800) If I read it right, kittens sold are always spayed or neutered which I assume means you can't buy a young kitten, only one over 6 months old. No doubt this is to keep some sort of patent protection going. This is not a joke! The company web site is here and an explanation of how they did this is here. News reports are coming out. Check out one from CBS and one from Yahoo. A video is available from here. Now this take the discussion about buying cats from breeders and pet shops to a whole new level. Can anyone say "lifestyle-pet company"? Scoop is patrolling the fridge area, shouting MEOUW! at regular intervals. He knows I went to the wet market this morning, and he's confirmed I bought some nice fresh chicken liver as well as some chicken legs. Now old fuzzy is demanding an early lunch. It's always the same on market days. I stagger out of bed at 7AM, drive to the local market, and then try to figure out what we might want to eat in the next day or two. When the sight of even a raw tomato is not quite the thing, this is not easy an easy job. Luckily I have firm instructions from Scoop. His order is the same each time: chicken of any shape or form, plus a slice of fresh beef just for fun. Cats: they take over your life - and your shopping basket. PS a picture of our local wet market. There's a good post on New Cats On The Blog about breeders and pet shops. This is a very interesting topic sure to get all cat lovers excited! Scoop and Au were strays before they moved in with us, but I did buy a cat in Malaysia once. She was a reject from a Kuching Malaysia (also known as Piawaian Kucing Malaysia) breeding programme. I bought her in Kajang from a breeder who was licensed etc. I can't remember the name of the woman, but when I popped over she sold me the cat - no questions asked! I literally turned up with the cash and took the cat away with me. Nobody asked me if I knew anything about cats, where I was taking her etc. They also didn't take my name, number or any contact details. I abhor kitten mills and find most pet shops to be modern incarnations of Ancient Roman slave markets (motto: got the cash? take it home!) but my experience says breeders can be purely interested in $$$ too. PS To me Kuching Malaysia look like Siamese but experts say they look like Tonkinese cats. The Tonkinese cat picture here is courtesy of Scott Turner. We’ve got a heap of kittens at the back. Two are pure black, two are calico. The black kittens are slightly larger than the calico ones, so we’re guessing that they are different litters. It’s hard to tell who belongs to whom, as the black girls who live in the back lane are all sisters and half-sisters who share everything – from their food bowls to their lovers to the duties of motherhood. The kittens are just piled on top of each other, with mums popping in from time to time to give them a quick clean and cuddle. We’ve given the kittens a box to sleep in, and are giving the mums some extra food. There are about a dozen stray cats living in the back lane. When we first moved here they were raggedly creatures, full of sores. Thanks to twice daily cat biscuits, dosed with worming medicine at proper intervals, they now look clean and glossy. But the fact is that there are too many of them. Even if we could catch these cats, the cost of taking a dozen of them to the vet to be spayed would be prohibitive, especially as almost all are girls who would need to be boarded for a few days. Kittens and cats are lovely, but we do wish some of our tax money would go to a catch, spay and release programme to reduce the number of strays. I was trawling the web the other day when I came across a notice of a cat show. I think Scoop’s corkscrew tail and Au’s little stub that's set at a 45 degree angle (see picture to see how cute!) are part of their attractiveness, but I suspect it puts them beyond the pale in cat beauty competitions. Just as well really, as neither is the type to enjoy a cat show. Au isn't keen on strangers; he takes his time to get to know new friends (except for our friend Usha whom he adored the second he met her). Scoop loves people but he loathes loud noises. Neither likes traveling in cars. I've only been to one cat show but it was enough to put me off. Too many cats looking upset, too many people milling about poking cages, and far too many kids yelling and screaming. There have to be cats and people who love that sort of thing, but we'll just stay at home and wait till some enterprising TV manager realizes pretty cats are much nicer to look at than Miss Earth/Mr Universe or whatever. PS Katz Tales is out tomorrow in the Weekend section of the Malaysian Star. Buy it, send in a picture of your cat and win a hamper! We had a long discussion yesterday in the pub on whether cats should be inside or outside creatures. I let Scoop and Au decide whether they should be indoor or outdoor kitties. The sliding door is always open, so they can go in and out as they please. And being cats, they enjoy the best of both worlds. Our fuzzies spend most of the day at home, lolling around in bed and on the sofa. They're out late at night, but I think they spend most of their time in our own garden because when I nip downstairs for a drink of water, there's a small fuzzy asking me what I'm doing up the second I reach the kitchen. In and out, they seem to be having a ball. And that's what a cat's life should be. Every morning Scoop and Au come upstairs at dawn to ask Tom to get up and serve breakfast. When Tom stumbles downstairs, they open a sachet of cat food together, and dump it into 2 dishes. Au then moves from one dish to the other, pushing Scoop out of the way each time. Scoop being a patient, peaceable person doesn’t mind. This is pretty standard cat behaviour. Every cat always thinks the food is better in the other bowl. What blew me away though is that Tom tells me he puts food in 2 dishes even if Scoop is having a long lie. Apparently Au doesn't really enjoy breakfast unless he can dance between the bowls. PS here's Scoop and Au having breakfast. He's back! The cat with the dirty face marched up to the front of the house, and tried to break in. Unfortuneately for him, Au was standing guard. When I heard the ritual exchange of insults turning into a big furball fight, I went out to break it up. Imagine my surprise when Scoop shot out past me, and dived into the scrum. When Scoop gave the cat with the dirty face a big wallop with his paw, the invador realised two against one are bad odds. My appearance was the last straw. The enemy took one look at the united front, turned tail very slowly, and marched off with both fur and dignity intact. When Au came in he pretended to be annoyed at the interference but the way he licked my hand when I checked he was OK showed he was secretly quite relieved. This morning the dirty faced kitty turned up at the back door asking for biscuits as though nothing had happened. Let's hope he stays there! PS The cat with the dirty face eating breakfast. Taking Scoop for his inoculations is easy. I put him in his cat carrier, trundle off to the vet, and hold his paw while he gets his shots protecting him from nasty diseases like cat flue and leukemia. Au is an entirely different kettle of fish. First off, he explodes out of the cat carrier as soon as the car starts moving. Mr kitty is so big and heavy that he broke the hinges off the door. Second, I find it very hard to hold him steady when he spots that needle. Luckily we have a nice vet nearby who does housecalls. I scheduled him and Tom to be here at the same time yesterday, and turned my back while Au, crying pitifully, had his shots. Although Tom says Au didn't even notice when the needle went in, and the whole process took less than 2 minutes, our little fuzzy made the most of his traumatic experience by demanding extra treats last night. Cats really know how to milk every situation! PS curious about cat inoculation schedules? Check this link on vaccinations. Such sad news to hear about Steve Irwin's fatal accident yesterday. I loved the Crocodile Hunter's boundless enthusiasm, and enjoyed the way he brought the daily details of the lives of snakes, tortoises and other creatures to the screen – although I still don’t want to hug a crocodile! Irwin reminded me of one of my childhood heroes, Gerald Durrell, the British conservationist who revolutionized zoos and founded Durrell Wildlife in Jersey. Irwin was a master at creating powerful television shows; Durrell's best work was in books. Inspirational and hysterically funny, I think I’ve owned three copies of My Family And Other Animals and read each to bits. People like that fascinate me because they have done so much to bring us closer to our animal friends. Watch the life of a croc with Irwin and his camera crew, and you'll think twice before draining a swamp and running a motorway through it. Durrell's tales of hairy frogs in the Bafut Beagles, and catching bats with the aid of jackfruit in Mauritius in Golden Bats And Pink Pigeons are equally unforgettable. I think what made them so appealing and persuasive is that neither preached like so many ardent greenies do. I’m going to re-read all my Durrell books this week, and I’ll look to Animal Planet who should be putting on a tribute in the form of a Crocodile Hunter marathon.